In 1802, 25 villages in the southern part of the Epworth Circuit formed a new Circuit based around Retford with a total membership of 361. 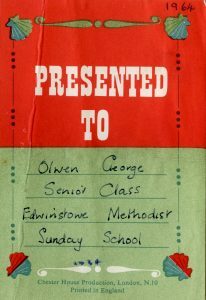 In 1816, twelve members met for a regular weekly service in Edwinstowe. (Retford Library holds lists of members-1803-1835 and B.J. Biggs’ study of Methodism in a Rural Society, North Nottinghamshire1740-1851. Thanks to the staff of Inspire: Culture, Learning & Libraries for their help). Although some of the earliest records are missing, we know that there were constant changes in the organisation of the Circuit with fluctuating membership 670 in 1813; 496 in 1816 (when some villages transferred to Gainsborough Circuit and others to Worksop.) In 1804, there were 2 or 3 ministers. In 1813, they had to cover 27 preaching places within an area of 50 square miles. If they were lucky they had the use of a pony or might be offered a ride in a cart. Even in 1823, when numbers rose to 820 there were still only 2 ministers. A network of Wesleyan Local Preachers grew up. Each new candidate was considered, if approved he became an ‘exhorter’ taking services, but not preaching sermons. If successful he was then allowed to preach ‘on trial’. 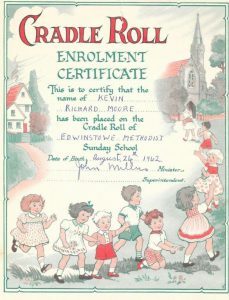 If he passed his exams his name was added to the ‘Full Plan’ at the bottom of the list. His conduct both in the chapel and in daily life was scrutinised. The worst offence was ‘neglect of preaching’, but personal and professional misconduct could include debt, drunkenness, working on a Sunday, opening an alehouse, marrying an unsuitable wife, assault and playing cricket in public! 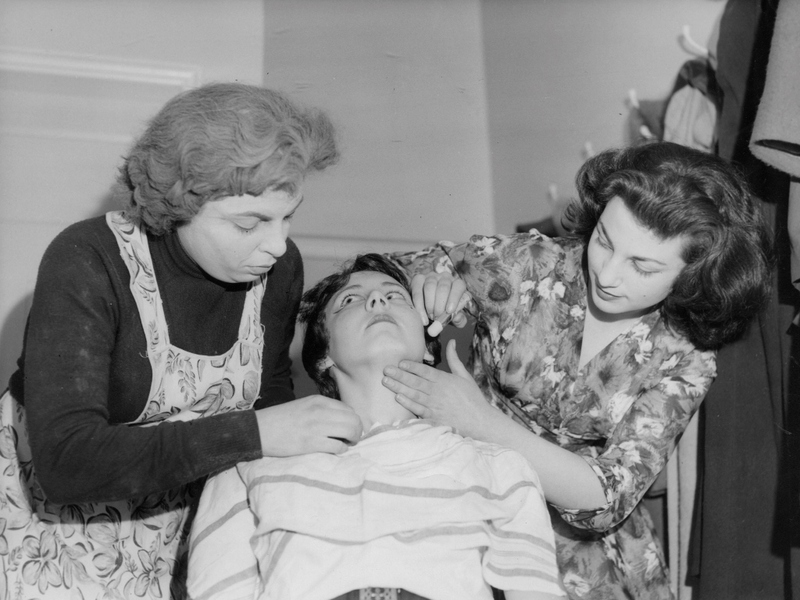 Advice to preachers included: Always conclude the service in about an hour; Never scream; Never lean upon, or beat the Bible; Do not, without the utmost necessity go home at night. Charles Richardson, “the Lincolnshire Thrasher” who was much in demand for opening chapels preached twice in Edwinstowe around 1844. Nottingham Review reports that on Tuesday October 12th 1847 the Foundation Stone was laid for a splendid new Chapel which opened the following year at the top of the High Street (‘Town Street’). An impressive flight of steps led up to the front doors. It was described as ‘the most stately and imposing of all in the (Worksop) Circuit.’ The estimated cost of completion was £600. 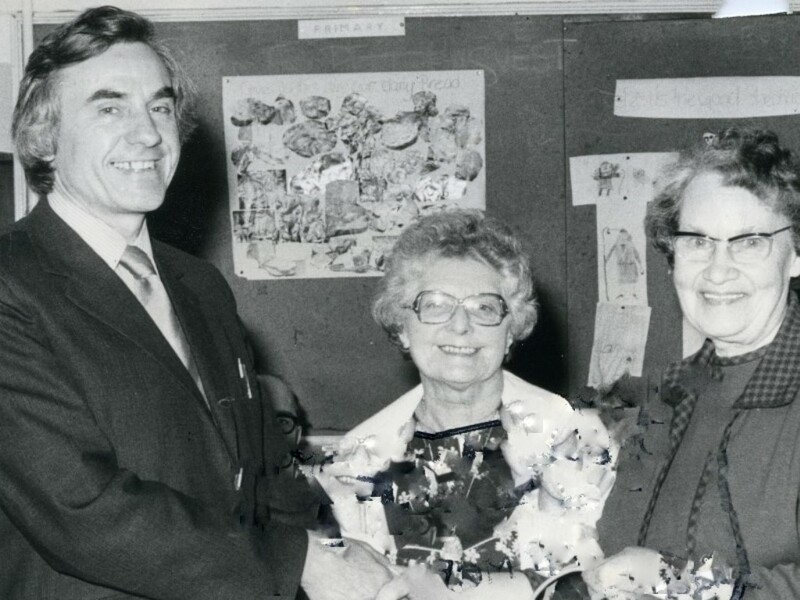 The founding trustees were almost all from Eakring. 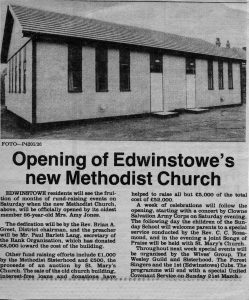 In the circuit there were 22 local preachers; 35 local leaders; 588 members and 53 members at Edwinstowe. 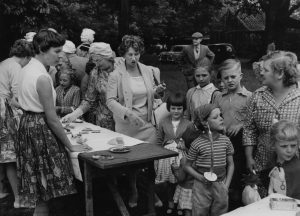 The company retired to a spacious tent where around 200 were regaled with tea and seventeen trays of plumcake. “During tea, a neat model of the intended new chapel, executed by Mr. Simpson the architect” was displayed. 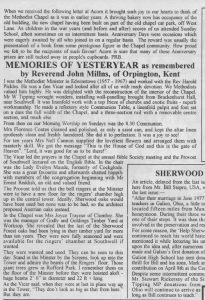 “After tea the company repaired to the old chapel” for a hymn and prayers – the speakers included Mr. Christopher Thomson of Edwinstowe. Wesleyan attendance figures from the Religious Census of 1851 were 60+58 (afternoon), 122 (evening). 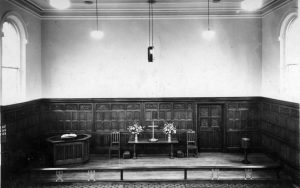 Both Primitive and Wesleyan Methodist chapels had well-attended evening services thanks to artificial lighting, although in the Wesleyan Chapel the ‘naptha’ lights were condemned mid-sermon by a preacher as ‘hissing, stinking lamps’ ! These were replaced by paraffin lamps first used in 1883 at the Harvest Festival. (The Story of a Forest Village M.J. Jackson) In 1929, Bolsover Colliery Company granted electric power for lighting the Chapel at the reduced rate of 3 pence per unit. According to Minute books (Nottinghamshire Archives) by 1870 the Chapel Trustees were struggling to repay a debt of £200. 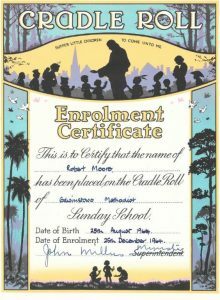 In 1883 a Schoolroom was erected at a cost of £300. 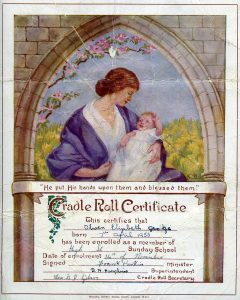 In 1907, the opening ceremony of a new Sunday School building was performed by Mrs S. Evans from Creswell. A Reading Desk in the new schoolroom was dedicated to its maker, Mr John Woodhead, ‘’in memory of his good work, both in the House of Prayer and in his daily occupation” also “a craftsman of rare ability and steward of equal excellence.” The following year various Trustees each loaned £50 towards paying off outstanding debts. 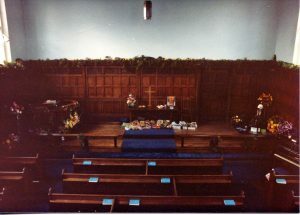 Around this time, the Chapel was refurbished at the cost of £300 reopening in 1911. On 2nd August 1912, the London Gazette announced that Edwinstowe Wesleyan Methodist Chapel was registered for Solemnizing Marriages. A list in Retford Library names the Trustees in 1854, as Rev. Frederick Slight (Ashbourne), John Watson (Bilsthorpe), William Herrod (Eakring) and Edwinstowe men – Henry Day (Cordwainer), George Webster and John Sidda (Farmers), George Page (Labourer), George Brooks (Carpenter), James Allsop (Blacksmith) and Benjamin Norman (Bailiff). In 1899, Edwinstowe was part of Worksop Circuit. Amongst the Trustees were Edwinstowe men Isaac and William Freeman, John Woodhead (wheelwright) and provision merchant Alexander Parnham (who ran a Temperance Hotel for the tourists in Birkland Lodge on the High Street.) Other Trustees came from as far away as March in Cambridgeshire, Worksop and South Anston near Sheffield. 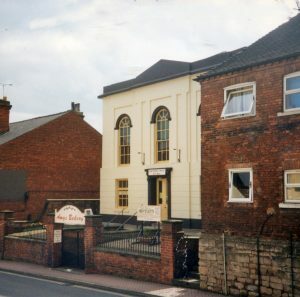 According to the 1915 Plan of Worksop Wesleyan Methodist Circuit, Edwinstowe had 6 hours of services on alternate weeks by 2 local preachers-Chapman or Pearce, the other weeks were covered by 5 preachers-Boaler, J.Ward, Leggatt, W.Ward and Padley. 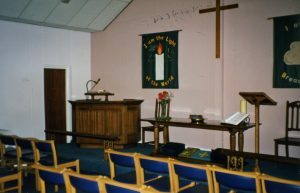 In the 1920’s, with the sinking of Thoresby Colliery the congregation increased. Until Nationalisation the chapel received £25 per annum from Bolsover Colliery Co. A 1933 list of members alongside Edwinstowe Stationmaster, Alfred Neville and baker, Samuel Juby, includes miners, fitters, electricians and a blacksmith living on the avenues in the new Colliery village. In 1939, a serious fire damaged the Chapel roof. The organ and floor were seriously water-damaged. It was finally decided to purchase a site and build a new church on West Lane. During the war all building was prohibited, so temporary roof-repairs were made and a second-hand organ was bought. In 1946, instead of building a new church, the existing church was repaired, re-opening in 1947. 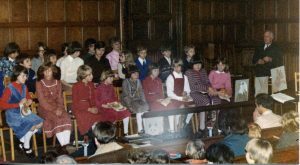 In 1958, at a cost of £1,350 the interior was improved with the addition of oak panelling from Brackenhurst House in the sanctuary. 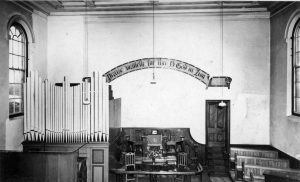 The organ was moved to the gallery increasing seating to 130 and a communion table donated by the choirmaster, Albert Annable, was installed. 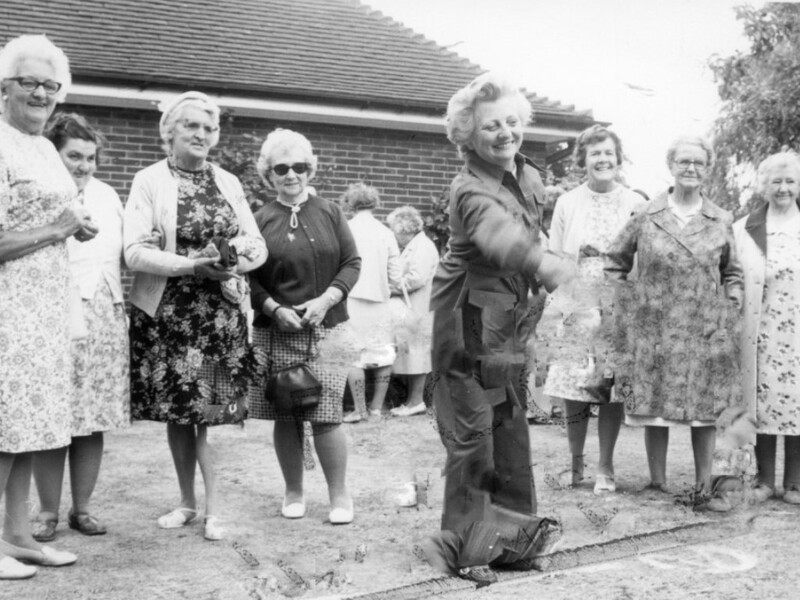 In 1967, at a cost of £2,189 an extension to the Schoolroom was built.